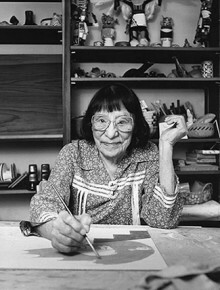 In the back of the Heard Museum, in a room all to itself, is a recreation of the working studio of Pablita Velarde, one of the country’s most famous Native American artists. Visitors can see the artist’s metate for grinding pigments along with jars of ground minerals. They can see the sewing machine she used to make tiny boots for Pueblo dolls and a photograph on her easel. “I’ve fallen in love with Pablita Velarde,” says Marcia. She expects to find materials on Pablita’s daughter and granddaughter as she opens additional boxes. There’s no end in sight for this project at the moment and Marcia’s fine with that.